Escentual Turns Pink for Breast Cancer Awareness Month! There is one person diagnosed with breast cancer somewhere in the UK every 10 minutes. That’s a staggering statistic, especially when you consider the extent of the impact not only on the sufferer, but also upon their family and their friends. Breast Cancer Care (BCC) is there for everyone who has been affected by the life altering disease. To keep on providing that essential support system in the best possible way, they need a helping hand to aid their helping hand. 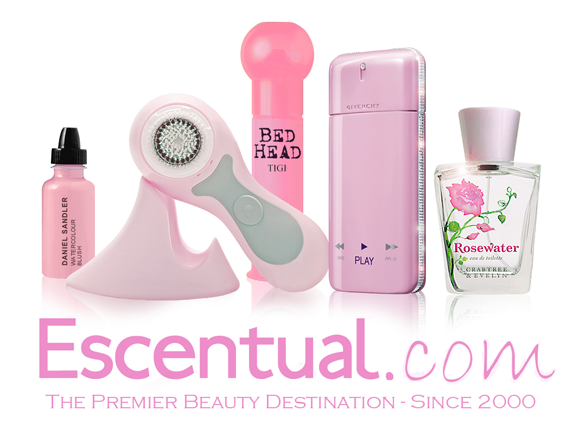 All this month is Breast Cancer Awareness Month, and Escentual are donating 10% of the sale price from over 40 pink beauty products directly to BCC, including the Clarisonic Classic in Pink, Jean Paul Gaultier Classique Eau de Parfum, L’Occitane Pivoine Flora Eau de Parfum, and the Daniel Sandler Watercolour Blush range. In addition, we’re going to be pretty in pink – the website will be all dressed up in a rosy hue in support of those 50,000 women who are diagnosed each year. If you’ve been affected, you’re just a phone call or a mouse click away from a friendly ear and expert advice – visit breastcancercare.org.uk or call them on 0845 092 0800. Breast Cancer Care is a beautiful example of the potency of female (and often male) togetherness, and we couldn’t be happier to support them this October. This entry was posted on Friday, September 30th, 2011 at 4:00 pm and is filed under Fragrance, Gifts, Haircare, Make-up, Skincare, Special Post. You can follow any responses to this entry through the RSS 2.0 feed. You can skip to the end and leave a response. Pinging is currently not allowed.